How to store your fresh apples for a good long time. In the north, where temperatures are reliably cold in fall and winter, it’s pretty easy to keep apples fresh for a long time just by storing them in an unheated pantry or root cellar. Here in Tennessee, we have some extra challenges with heat and moisture, but it can be done. First, you want to choose a late season apple with firm flesh and a thicker skin. Fuji, Cameo, Ida Red, Braeburn, and Mountaineer are some of the very best keepers. Mutsu, Rome, Jonagold, and Jonathan are pretty good also, but they won’t keep as long. Make sure the apples you plan to store are free from bruises and blemishes. 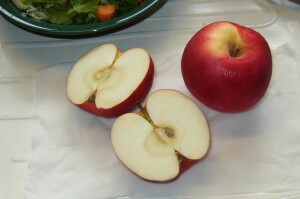 Even a small cut or bruise can spoil a whole lot of apples, so it’s best to use the blemished ones for something else. It’s important to keep the apples somewhat separated, so that if one starts to go bad, it doesn’t affect the others. Some people suggest wrapping each apple individually in newspapers, but the inks are toxic and not something I want touching my fruit. Instead, I like to use blank newsprint paper, which I buy for about $3.50 a roll end from my local newspaper office. (It’s good stuff to have on hand for sewing patterns and school projects anyway. We use it all the time.) You could also use paper towels, or even scrap fabric. Either layer the newsprint between layers of apples, or individually wrap each apple in the paper, twisting to keep the paper secure. Or, take a look at Wilda’s method below. She’s amazing when it comes to fruit storage! Wilda keeps all her fruits this way, and she often tells me she still has peaches in her fridge from 4 weeks prior. If apples are not kept in a humid environment, they start to become shriveled, soft and dried out. To keep the apples from drying out, place the layered or paper-wrapped apples into plastic bags. Leave the bags slightly open or perforate them to allow for some air circulation. The very best place to keep apples is in the refrigerator. They last the longest when they’re kept between 30 and 32 degrees and at about 90% humidity. The problem we run into is that our refrigerator is not nearly big enough to hold all the apples we would like to eat between fall and spring! Our solution is to put as many apples as we can comfortably fit into the fridge. The rest, we put in an unheated outbuilding where they’re safe from mice and other critters. The outdoor apples are used first, leaving as many as possible in the refrigerator, and we move more to the fridge as space allows. Even though the weather is still relatively warm when we buy our storage apples in late fall, the combination of fridge and out building storage has worked well for us, and we’ve been able to keep our apples into February and March, sometimes even April. That is, if we’ve bought enough of them! Erin, Our last two Ida Red apples are gone! The last ones were as good as the first. They did not shrivel, have bruises, or bad places. They have kept better than any other kind of apple I have tried, and we really like the flavor. I am attaching a picture I made today (June 4). I look forward to ordering more in the fall. Thanks so much for making these apples, and other items, available to us. I store the apples in an extra refrigerator I have in the basement. I put them in plastic grocery bags, a couple layers of apples in each bag, with paper towels top and bottom, and between the apples. The paper towels absorb extra moisture. Store them loosely (don’t tie the bags) so they have some air circulation. I did not lose one apple. This has worked for me for years. Do you have a storage method that works well for you? Please let us know! We had great luck with storing apples we bought from you last year. We have a walk-in cooler which really helps but the interesting thing was one of my friends stored her apples in our cooler, each apple wrapped in newsprint paper. I stored mine in wine boxes with the bottle separators inside, (available at any liquor store). I put a double thickness of toilet paper between each apple and a piece of cardboard on top of each box for easy stacking. We used the last of our Cameo’s in July and my friend’s Cameo’s were spoiled by April. I have found my favourite way of storing apples, although it only lasts a few seconds – I cook and eat them, covered in crumble or custard. I am going to try and store some Bramley Seedling apples, for the first time this autumn (fall). I am going to try placing each apple, with a little tissue paper under it , in its own plastic bag (just to absorb any moisture) The apples I have are all ‘windfalls’ ,but the ones I have had in the kitchen so far this year have, mostly, kept for 2-3 weeks in a bucket ok. The kitchen is certainly warmer than 50 degrees f and a lot, lot warmer than the out house I intend to use. I will just have to check them every week, but at least if any go bad then it shouldn’t spread to the others.